What Does This Have To Do With Lindy Hop? So one thing you may not know about me (Tina) is that I love, love, LOVE African Dance! So I was super excited when Nii Kwarty Owoo turned up in Leeds and started running weekly classes! His classes are brilliant and I want more people to know about them so I’ve organised a weekend workshop for him in November and I’m really hoping especially to see lots of Lindy Hoppers there. If you’re wondering, “What does West African Dance have to do with Lindy Hop”, the answer is “Basically everything!” Lindy hop is an African-American dance that grew out of earlier dance styles (Charleston, cake walk, tap, etc) that would have been heavily influenced by the traditional dances that came over from West Africa. This blog post does a much better job than I would of breaking down the influences and similarities that you might notice. For me, personally I find that African Dance feels vibrant and joyful in the same way that lindy hop does and it uses the whole body in ways that feel strong and natural. Its also similarly geeky and challenging. I’ve taken classes all over the world but still struggle to hear the beat of the music correctly and have to work really hard to figure out how to make some movements look right–I love the challenge! I hope you can join us in November, either to explore the roots of lindy hop or just to try out a new dance style. There will also be a drumming workshop and Ghanaian lunch but you can pick and choose which bits of the day interest you most. Brand New Class: Hot Charleston Weekly! We’re really excited to announce that there’s a new class in town! Spinning off from our fortnightly Hot Charleston Workshops in Leeds City Centre, this will be an hour long solo Charleston and vernacular jazz class! Absolute beginners welcome. No need to book, no experience required, no partner needed, just turn up for a great workout! Please note that Hot Charleston Weekly will replace the existing Lindy Hop class that currently runs at this time. However, there are still TWO more Lindy Drop classes to go before the end of 2017 and everyone is welcome to attend these! These are Tuesdays 5th and 12th December, so please do come along and give Lindy Drop the great send-off that it deserves! Our regular Hot Charleston Workshops at the Dance Studio Leeds, will continue as normal on Saturdays, the first one of 2018 being 6th January. Here’s a video of the most recent Hot Charleston Saturday workshop to give you an idea of the kinds of things we’ll be doing at the new Hot Charleston Weekly! We can’t wait! Last Classes of 2017 (and social dancing in December)! Pop these dates in your diary and we hope to see you for a festive dance soon! 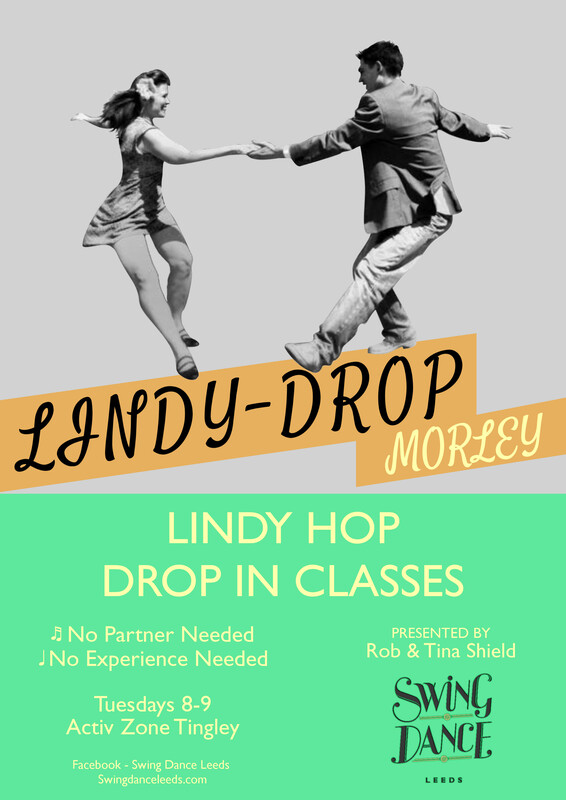 Drop-in Lindy Hop Classes every Tuesday! Now we’re in September with Autumn fast approaching, there’s nothing better than spending your Tuesday evenings learning how to dance this wonderful dance called Lindy Hop!